In a Nutshell: Many tech startups turn to Initial Coin Offerings (ICOs) as a way to raise capital while minimizing their risks and regulatory costs. Investors use legal tender or cryptocurrencies, like Bitcoin or Ether, to invest in ICOs. In exchange for their investment, investors receive custom virtual coins that represent shares of a company. Those coins can increase in value depending on the success of the project or company being funded. CoinSchedule.com has listed ICOs from around the globe since the beginning of the industry and continues to update its list of available offerings daily. CoinSchedule’s innovative Trust Score helps investors differentiate between ICOs run by trustworthy sources and those headed by bad actors who look to scam people by seeking funding for fake projects. Cryptocurrencies like Bitcoin and Ether became so valuable in 2017 that new markets started popping up to cater to speculators seeking similar massive gains. Innovative companies helped establish a thriving market for initial coin offerings (ICOs) as their way to raise quick capital while minimizing risk and regulatory costs. To initiate an ICO, companies create their own virtual currency and exchange it for legal tender, or more established cryptocurrency. That funding is used to improve business operations or kick-start projects. Just as with an initial public offering (IPO), during which shares of a privately held company are sold to institutional and private investors, an ICO provides investors with a speculative stake in a company’s future earnings in exchange for an upfront investment. Once a funded project goes into production, the coins sold during the ICO can grow in value and increase investor returns when sold to other investors. The cryptocurrency Mastercoin held the first known ICO (also known as a token sale) in 2013 and raised 4,740 bitcoin in one month. A few other offerings took place in the next three years, but the industry was slow to grow. In 2016, Alex Buelau co-founded CoinSchedule.com as a platform for listing various ICOs taking place around the globe. Buelau said he often wondered during the site’s infancy if there would be a market for such a resource. Buelau no longer has to search for ICOs. As cryptocurrency prices climbed in 2017, so did the number of ICOs available to speculators. CoinSchedule received so many ICO submissions by early 2017 that the website went from a side project to a full-time job that now employs 15 people who work to assess the more than 20 ICO submissions the company receives every day. But, as with any new technology, both good and bad actors made early ICOs a crapshoot. Scammers offered seemingly legitimate ICO listings with no intent to embark on the project they sought funding for. To minimize investor risk, CoinSchedule recently released its groundbreaking Trust Score algorithm that aims to increase confidence in any project listed on the website. CoinSchedule worked with researchers from the University of Oxford to create the algorithm used to assign each Trust Score. While Trust Scores are intended to instill investor confidence, Buelau said they are not an indication of the potential success of any investment. To create a Trust Score, the algorithm assigns each listed ICO a number value between 0 and 100 based on the strength of the company’s underlying fundamentals. That score translates to a letter grade to make sorting through the available offerings easier. 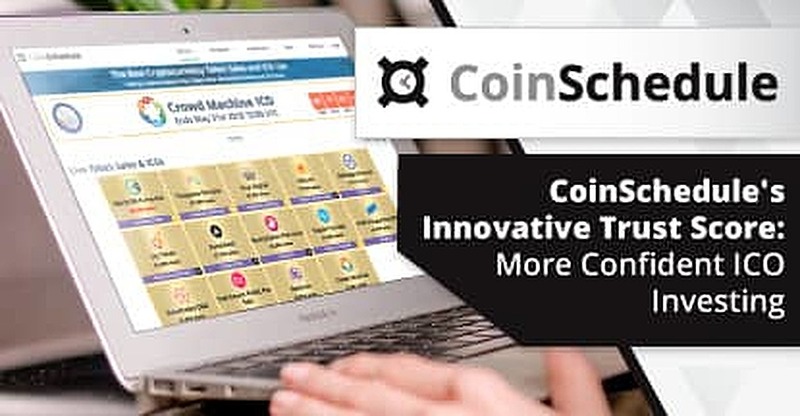 CoinSchedule didn’t need to assess any listings during the site’s formative years because scammers saw little value in an industry with very few users. That changed in 2017 when a spike in listings forced Buelau and his team to find a way to differentiate between good and bad offerings. “The first thing we noticed when the market exploded is that we got a lot of spam email from the same people submitting many projects under the same, or a slightly different, name,” Buelau said. Those submissions attempted to gain multiple listings on CoinSchedule, thus acquiring more attention on the quickly growing website. To combat the problem, CoinSchedule instituted a small fee for anyone listing an ICO on the platform. The tiered system worked until the amount of money raised by offerings became so great that scammers were willing to pay higher fees for premium exposure. Buelau was soon faced with a website that had a large audience of followers who wanted to invest in exciting young companies, but wanted a better way to discern which offerings were trustworthy. ICOs help many large companies, like popular messenger application Telegram, sidestep traditional funding methods and bring in millions in new capital in a matter of weeks. But Buelau said he doesn’t see the popularity of the token sales as a threat to banks. Instead, a competition is brewing between ICOs and Venture Capital (VC) — a traditionally popular funding method for tech startups. But not every industry believes bigger is better. As large corporations test the ICO market to raise funds, Buelau said he sees the industry losing sight of its original purpose. Experts have debated for years about the proper degree of regulation required to maintain a fair and healthy financial marketplace. The unregulated nature of cryptocurrencies make them attractive to some speculators, but as the industry grows, others see a need for a uniform set of rules to play by. Buelau said he expects regulations — if done properly — to attract more money and a greater number of serious investors to the CoinSchedule platform. That, in turn, will give credibility to the ICO market in general and help it grow into its next evolution.